Ordinarily, I’d like to share beautiful photos, or at least ones that convey useful information, such as a title sign. But today you’ll see some of my worst. 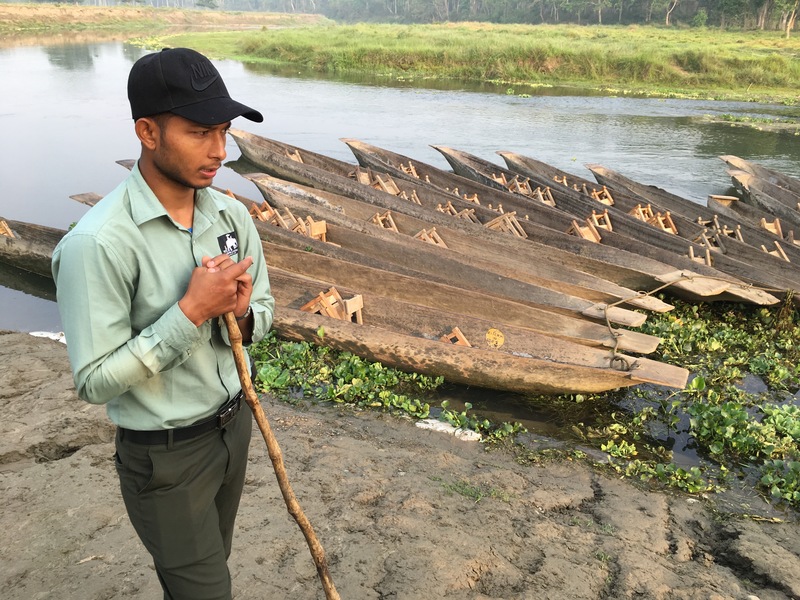 We were on a doonga (canoe)/walking safari in Chitwan National Park. 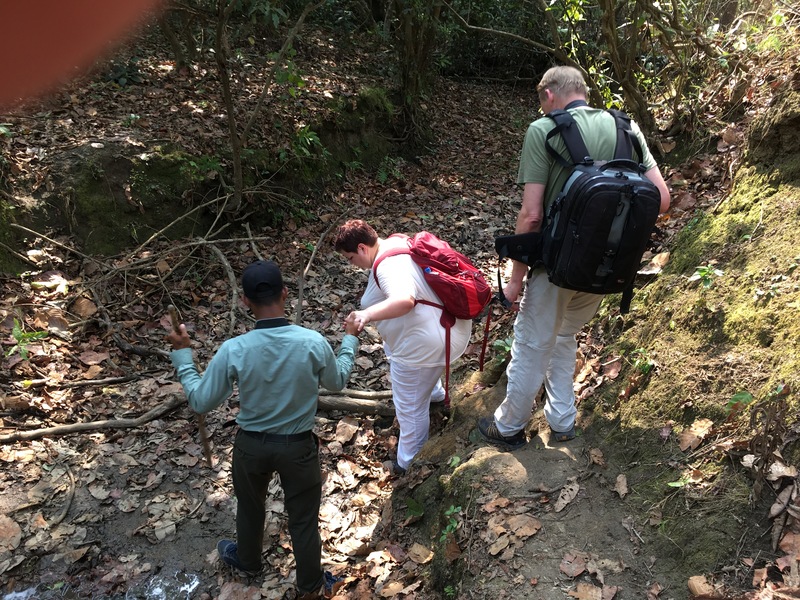 For this trip, we floated down the Rapti River for about 2.5 miles, then walked through the jungle for another 5-6 miles. 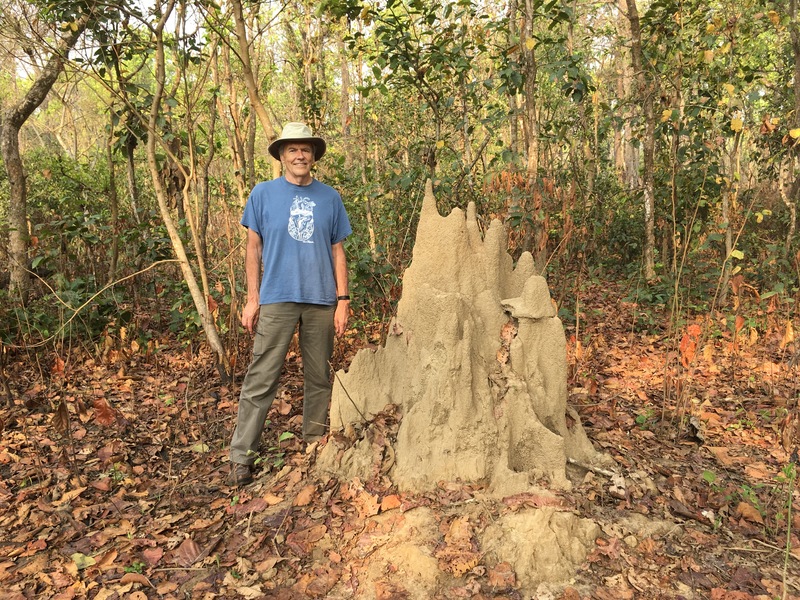 In the beginning of the doonga portion we saw unusual birds, elephants, lush tropical vegetation, and along the banks, the occasional crocodile, namely, the marsh mugger (Crocodylus palustris), or crocodile of the marsh. They’re listed as threatened–vulnerable, so we were careful not to disturb them. We felt fortunate to see majestic creatures whose ancestors appeared 200 million years ago in the Triassic, and which can grow to 10 feet or more long. 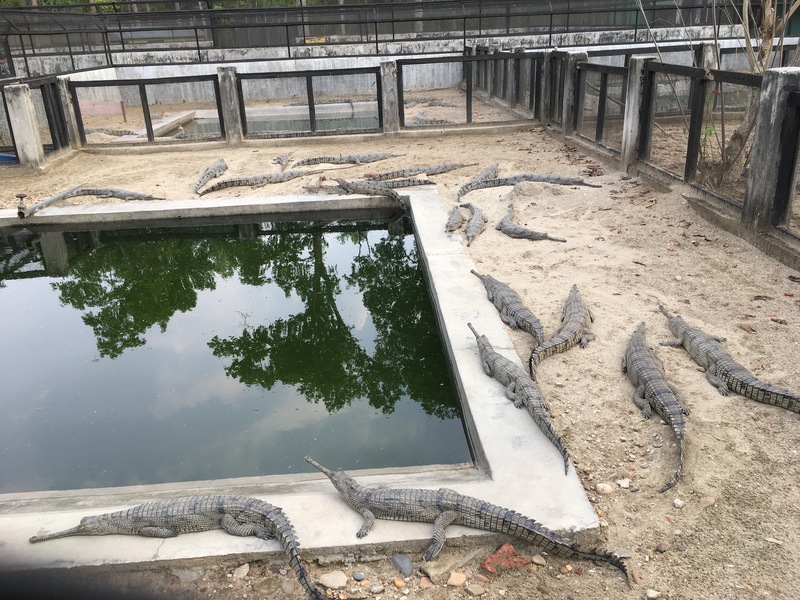 The area also provides a home for the critical-endangered gharials, or fish-eating crocodiles. 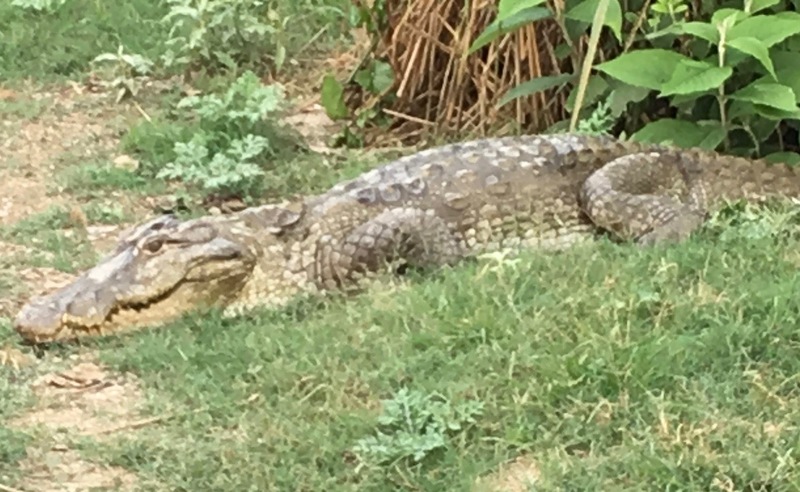 We didn’t expect to see them in the wild, but did see many at the crocodile breeding center. But there was a moment when I lost all interest in the marsh mugger’s conservation status. 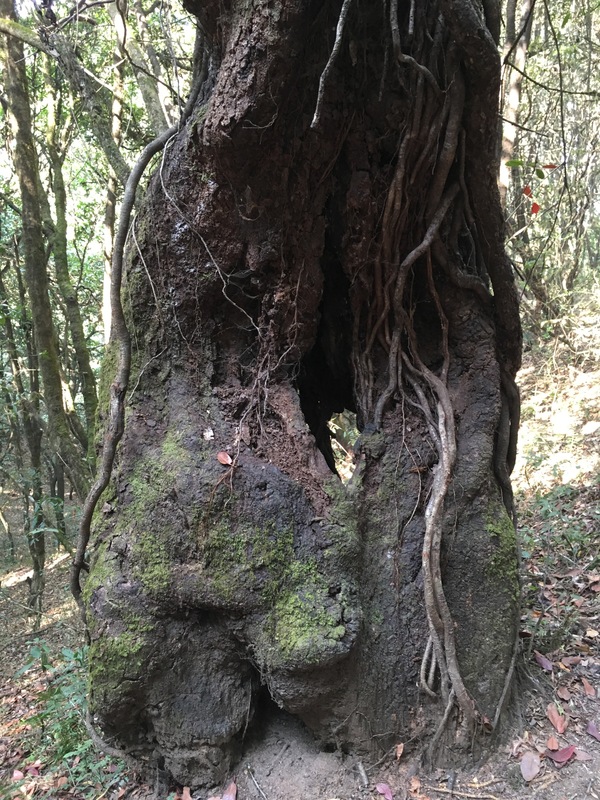 One large one approached our doonga, possibly touching it. His shoulders and front legs were next to Susan’s seat; his impressive mouth was next to mine. I knew not to trail my fingers in the water, but there would have been little defense against his attempting to overturn the canoe. As we had eight tasty people on board, and there were probably several other muggers nearby, that could have been disastrous. I tried to get a photo, but being generally inept and only now trying out a smart phone, I mostly managed to get photos of my palm and the sky. I won’t impose those on you, but I will share a couple that do show the crocodile. 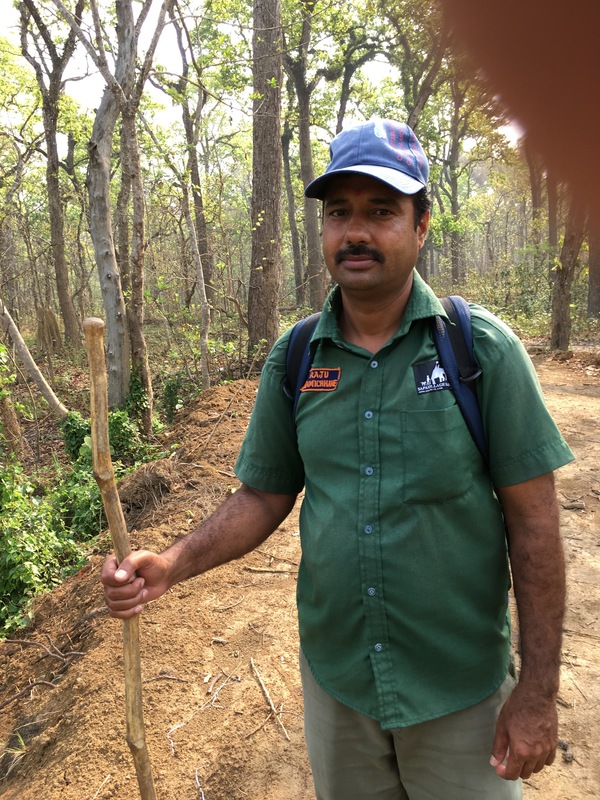 The most important photo shows the stick that our guide, Raju, used to bang on the head of the mugger to discourage it. Later, we learned that this was not a normal event, nor an exciting treat for the tourist, but a real emergency. 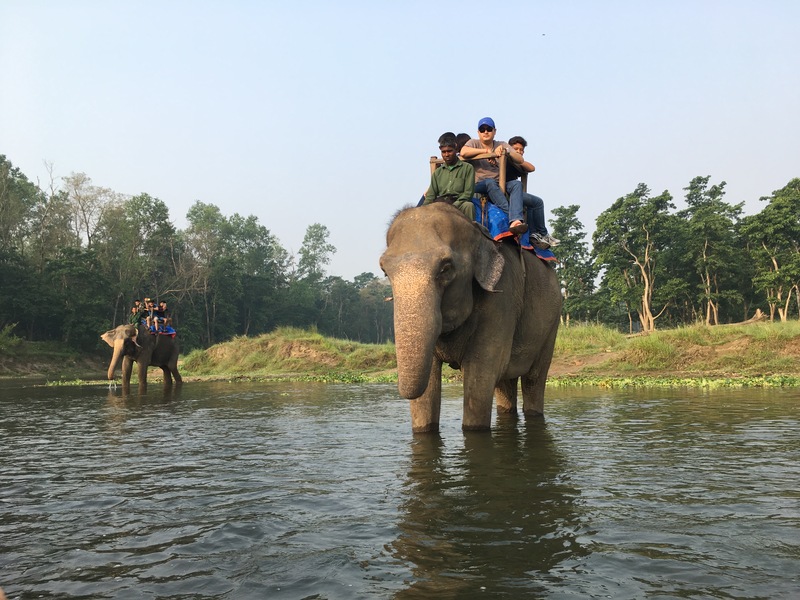 The story went around Sapana Village, and Raju was a deserved hero. 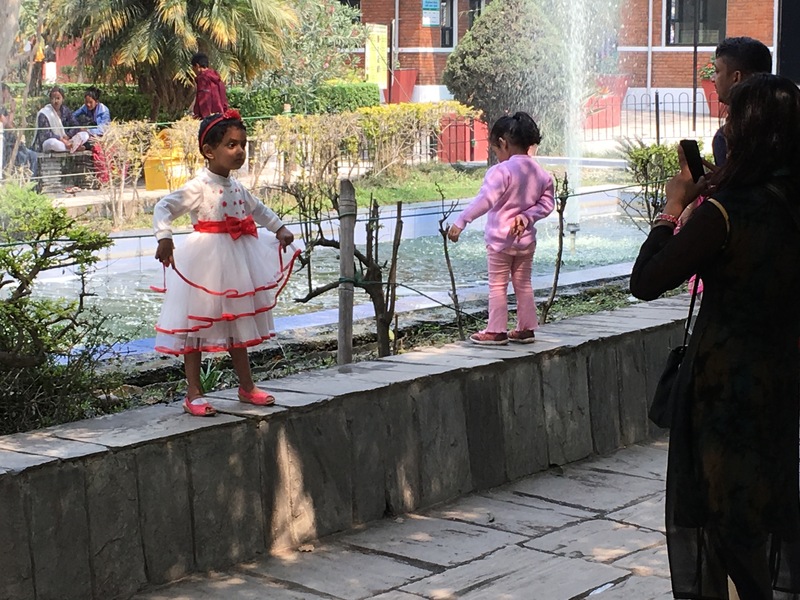 I had a delightful day at the Central Zoo in Jawalakhel. 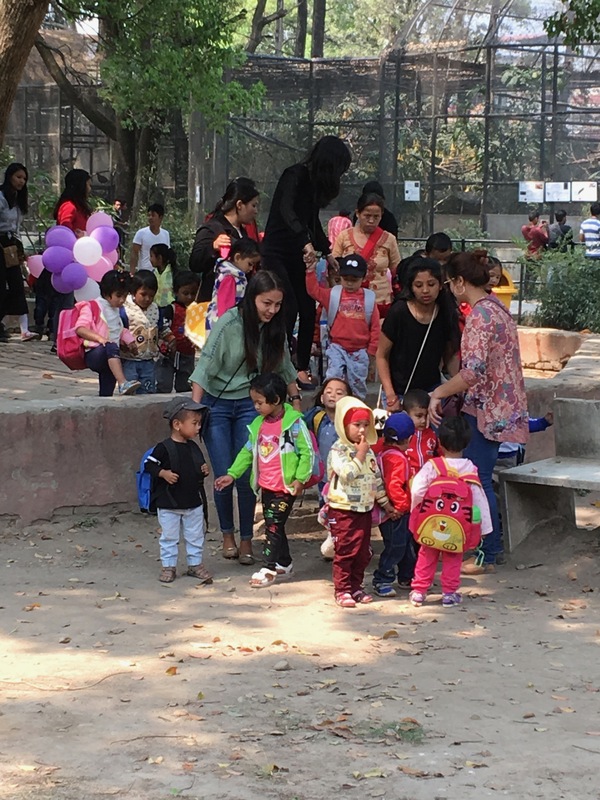 Despite some problems, the zoo is popular with families. 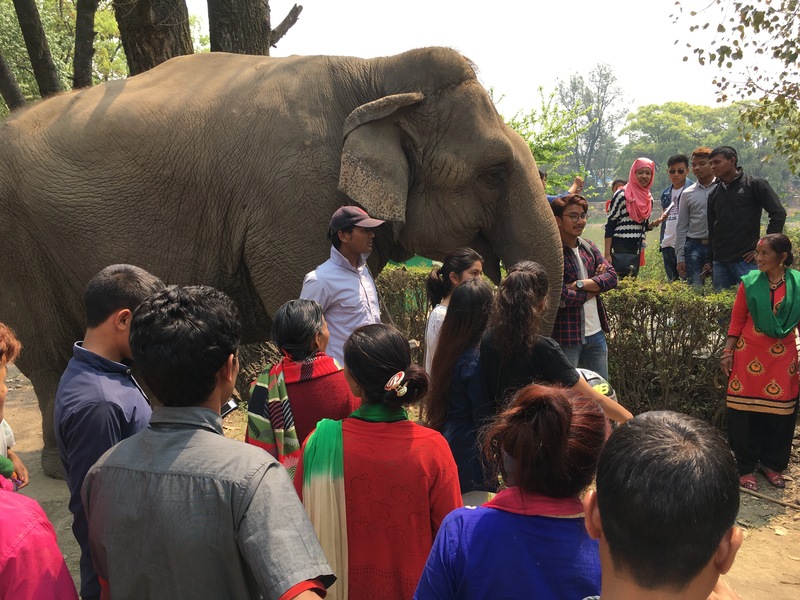 The Friends of Zoo collaborates with 200 schools in Kathmandu Valley. The zoo is working on better enclosures with improved habitats for animals and there’s a recently established Animal Hospital. I saw one obviously Western couple leaving as I arrived. Otherwise I didn’t notice any Westerners in a visit of well over two hours. They’re missing out. 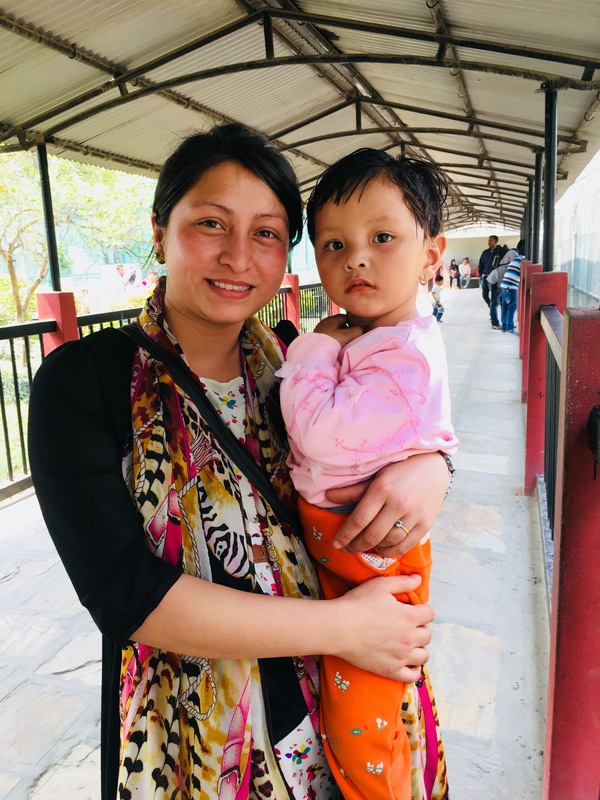 As much as I’ve enjoyed seeing the multi-starred sites like Patan Durbar Square, there’s nothing like a visit to the zoo for seeing Nepali families enjoying life together in a relaxed fashion. There’s photo taking (both ways) and ample opportunities for casual chats. This gives me a much better sense of the country than seeing some impressive monument. As with any zoo, there’s a clear priority on what to see: Plants and physical layout, yes; animals even more; and people best of all. 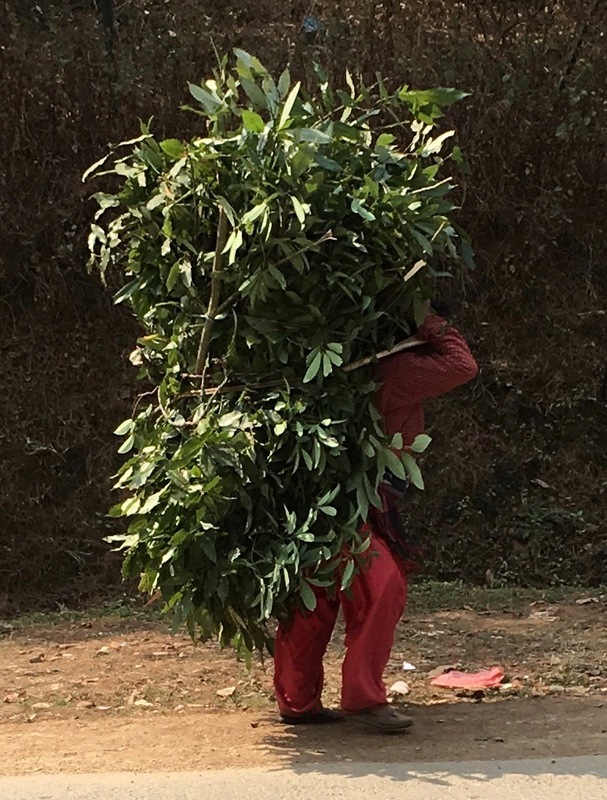 Girls and women were often in beautiful saris and other costumes, perhaps in part because of the holiday (Rama Navami, a spring Hindu festival). Boys and men, including me, were in the obligatory, international male costume of t-shirt and jeans, or other rough pants. 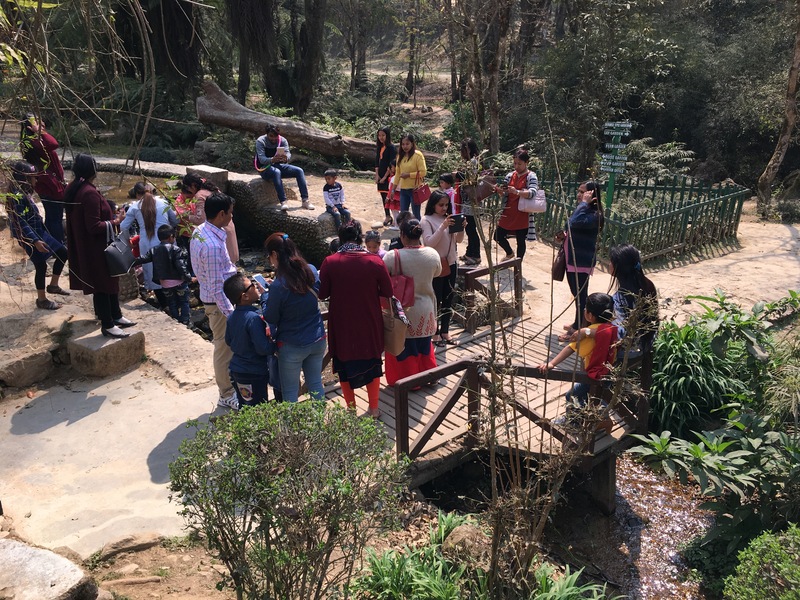 There were groups of pre-school age children, fathers with children, nature lovers, teenagers, old people, visitors from mountain villages, romantic couples, and many more. 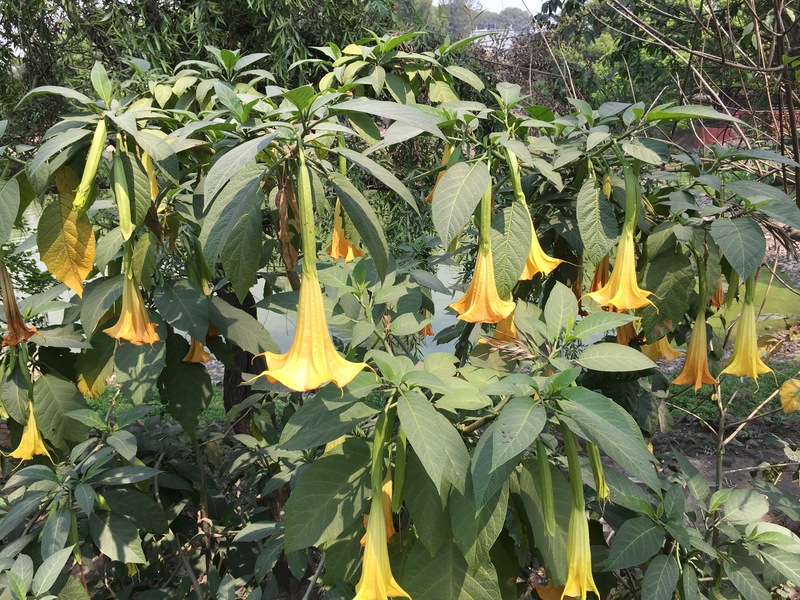 Nepal has remarkable changes in elevation and associated variation in eco-climatic conditions. It lies between the tropical Indomalaya ecozone and the temperate Palearctic ecozone. A total of 118 different ecosystems have been identified. 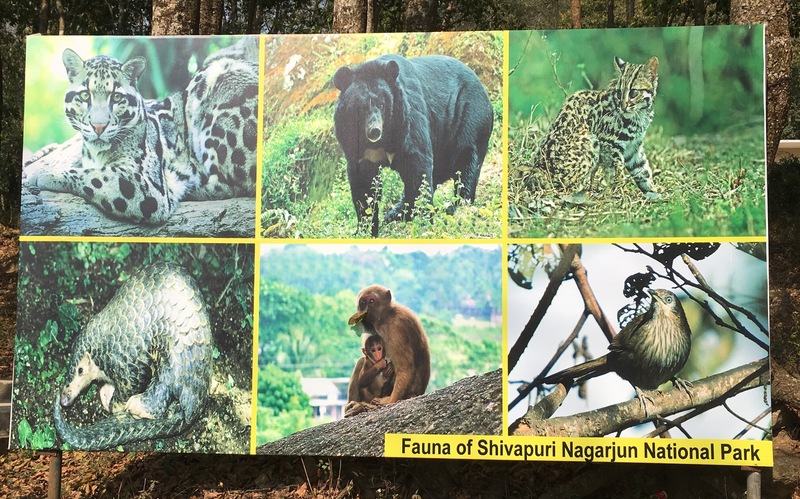 All of this leads to Nepal being a biodiversity hotspot, albeit one under severe threats as with biodiversity everywhere on the planet. 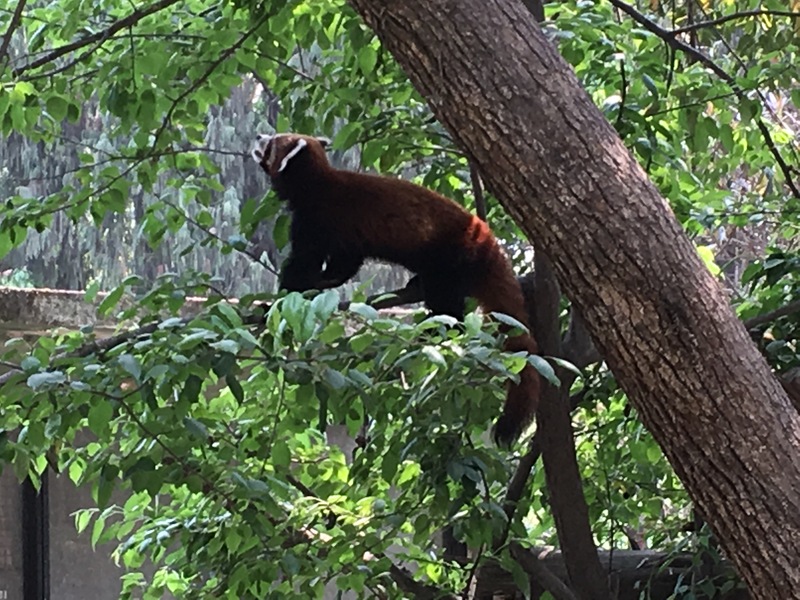 Among the notable mammals in Nepal are pangolins, Bengal tiger, one horned rhinoceros, Asiatic elephant, red panda, snow leopard, and Tibetan wolf. 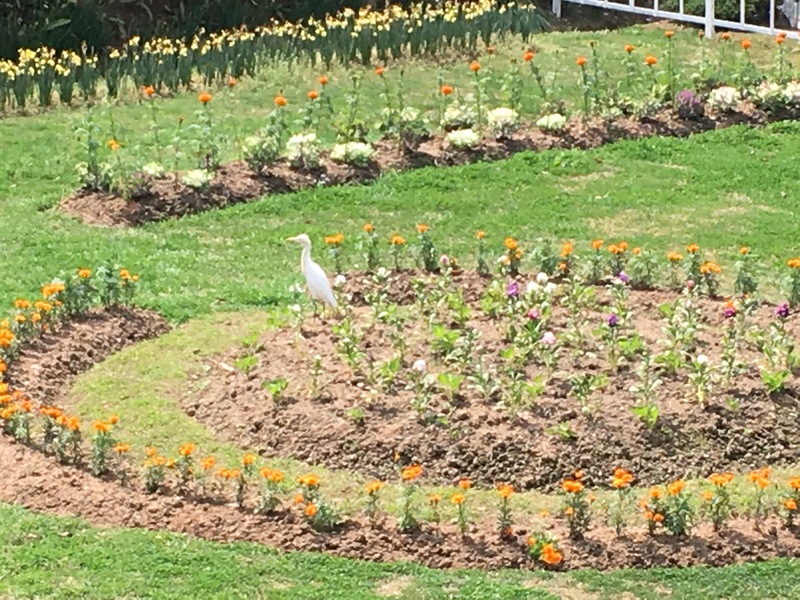 There are many reptiles unique to Nepal and over 900 bird species. The Himalayan griffon vulture is is the largest and heaviest bird found in the Himalayas. There are also many unusual fish, invertebrates, and plant life. 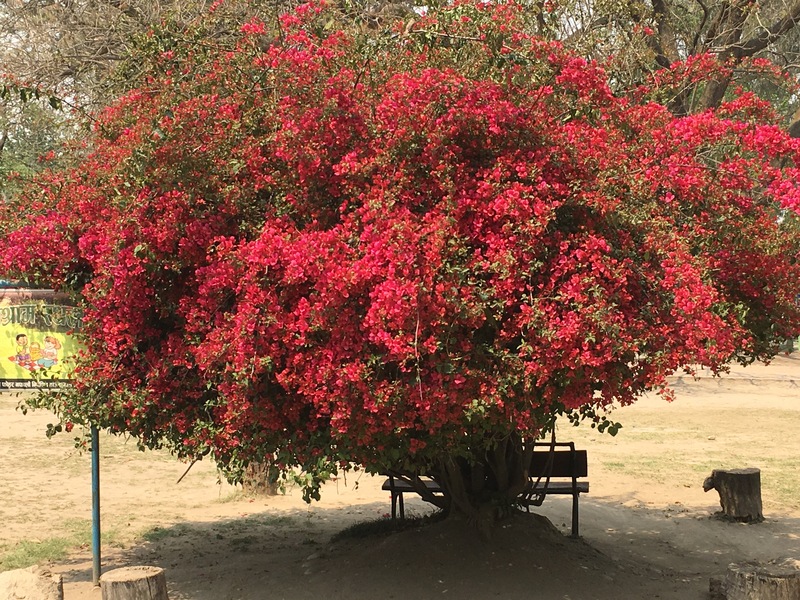 The red rhododendron grows throughout Nepal and is a national symbol. The zoo houses many of these creatures and seeks to expand its collection, especially of indigenous fauna. 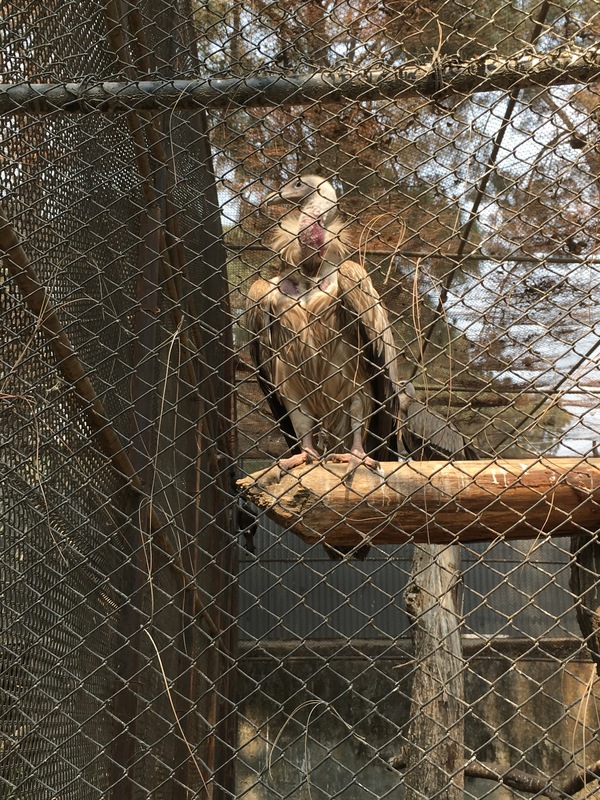 The zoo has problems related to space, budget, training, and animal care. It reminds me of some zoos I visited when growing up in the US, before funding improved and international zoo standards were enforced. 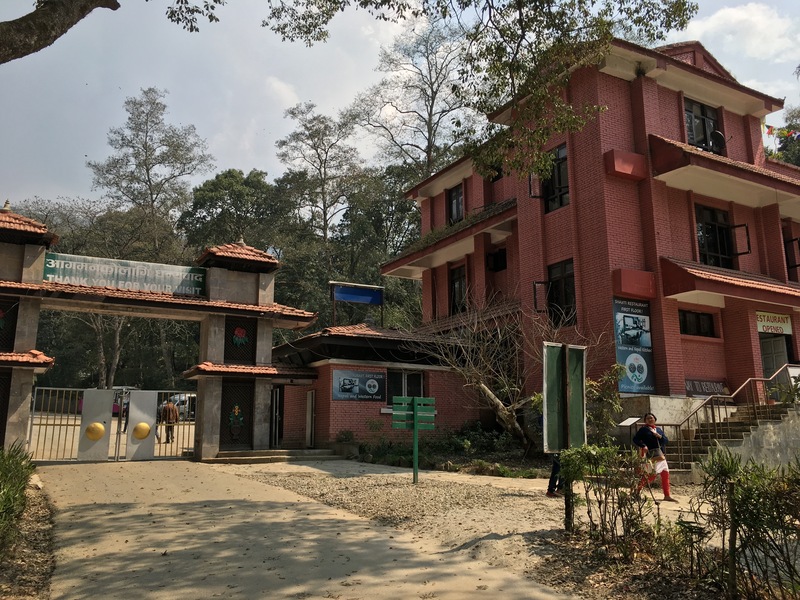 However, after 1995, the National Trust for Nature Conservation took over the zoo and has initiated projects to make it a fully modern zoo, with natural habitats, and facilities for education and research. It’s already become a refuge for live animals being smuggled internationally. 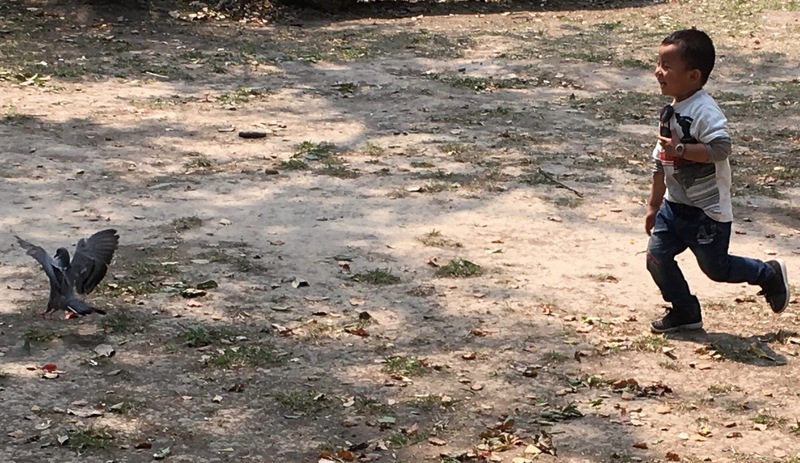 Comparing to the Lincoln Park Zoo in Chicago illustrates the challenge for the Central Zoo. It has half the acreage and about 3% of the budget. Even considering purchasing power parity it’s trying to do a lot with little. 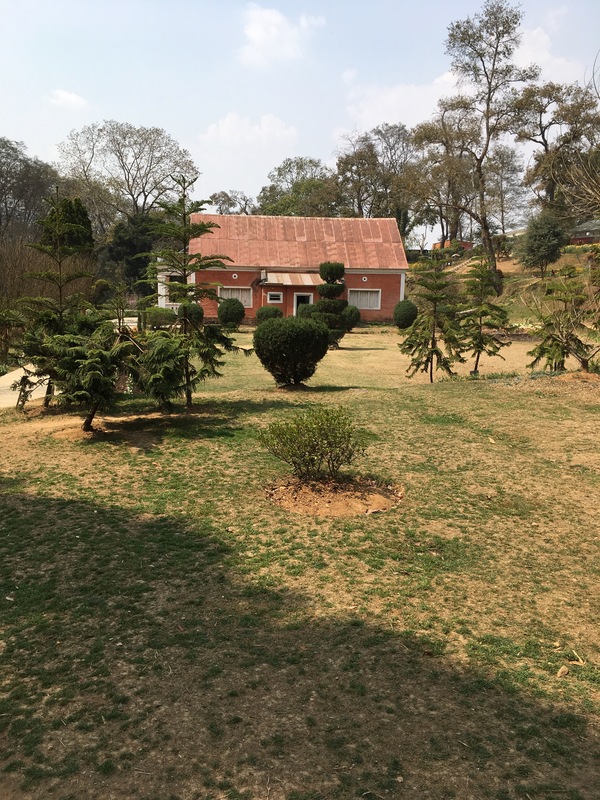 Juddha Sumsher J.B. Rana created the zoo in 1932 as a private trophy. He was maharaja and ruled Nepal as head of the Rana dynasty. 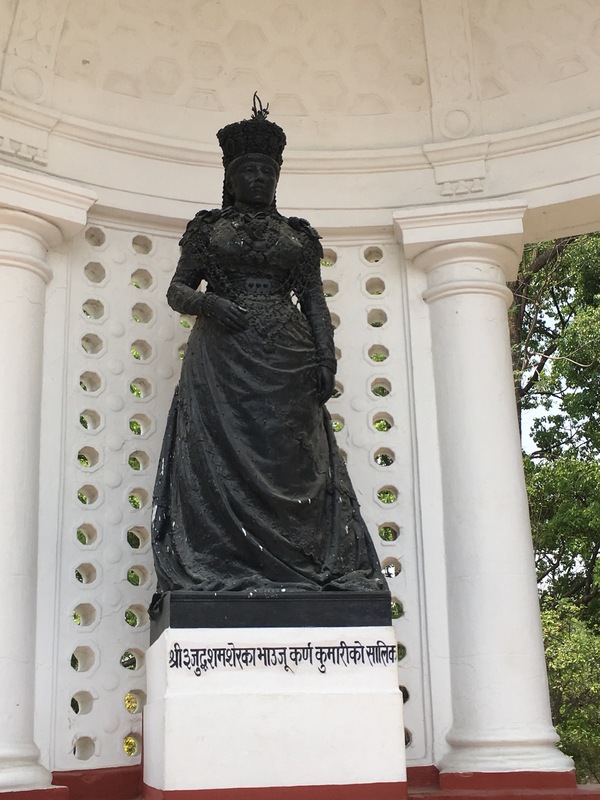 This explains the two incongruous statues of women standing in prominent positions. One is of his mother and the other of his sister-in-law. The zoo opened to the public in 1956 under various managements. 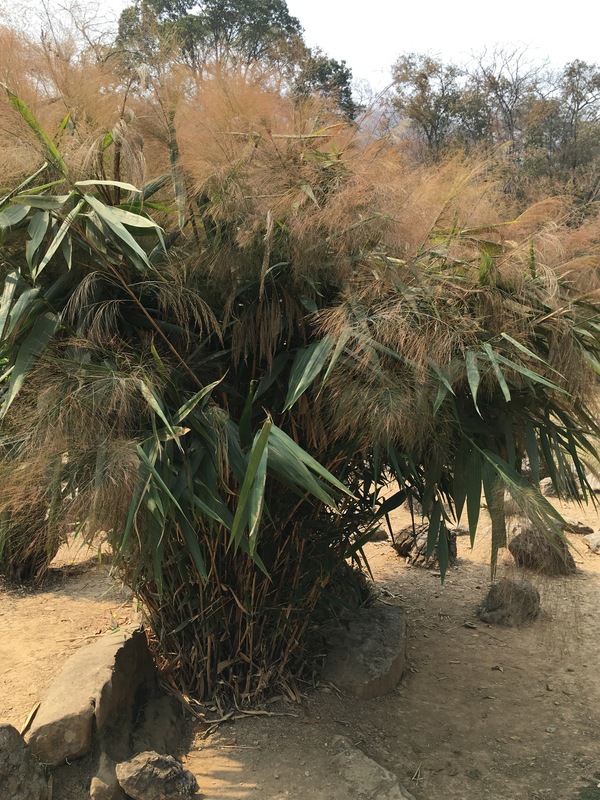 It’s called the “Central Zoo,” even though it’s the only one in Nepal. 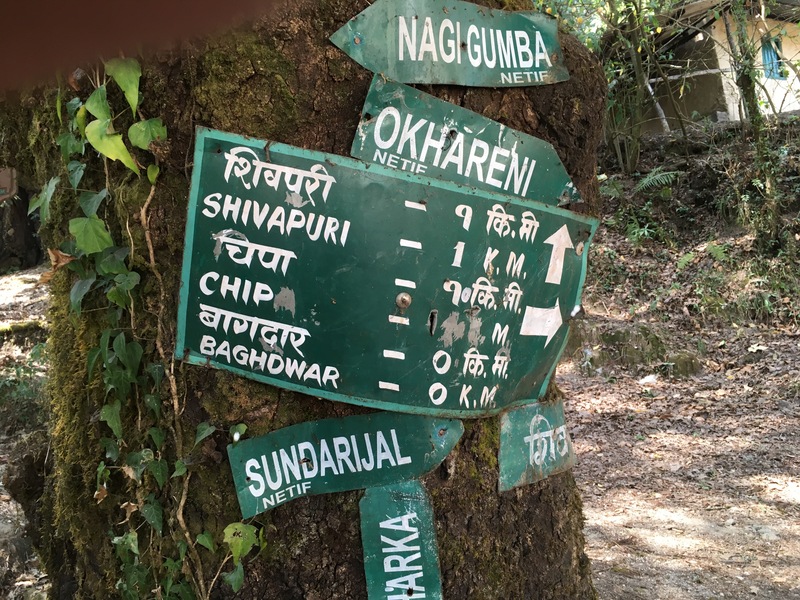 I recently “climbed” Shivapuri. 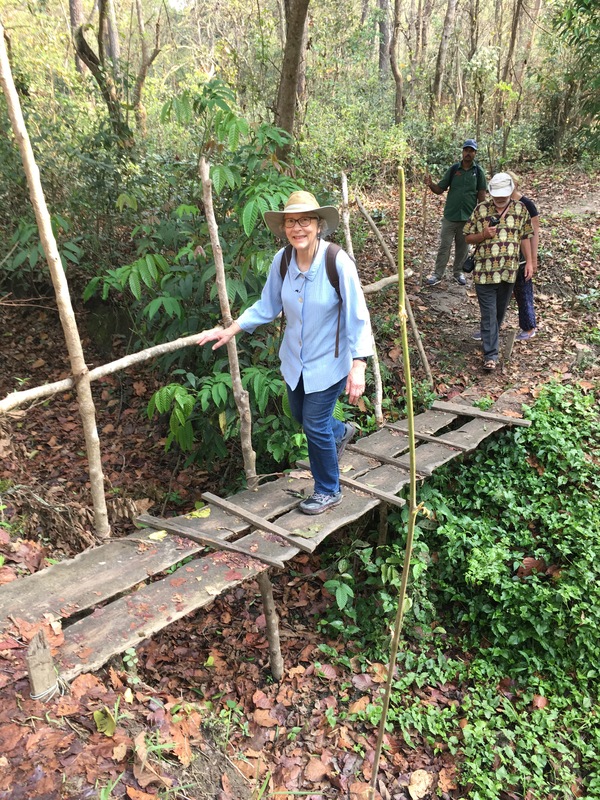 I have to put that in quotes, because for Nepalis and serious trekkers, this is a “short and easy walk.” For this flatlander, however, it was a serious climb. Most of the guides describe it as 3-4 hours up and 2-3 down, with extra time needed for photos, lunch, shrine visits, and such. So, it consumes much of one day. My fitbit got a workout, reporting 38,000 steps and 353 flights of stairs. To be fair to flatlanders, it’s not a negligible height–8,963 ft, easily higher than anything east of the Rockies in North America. 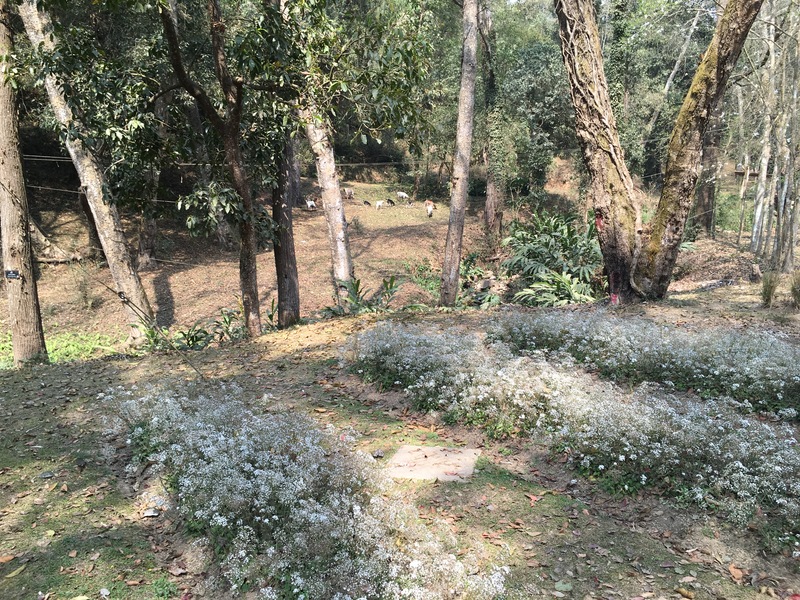 The Shivapuri park is in a beautiful national park, just north of Kathmandu. 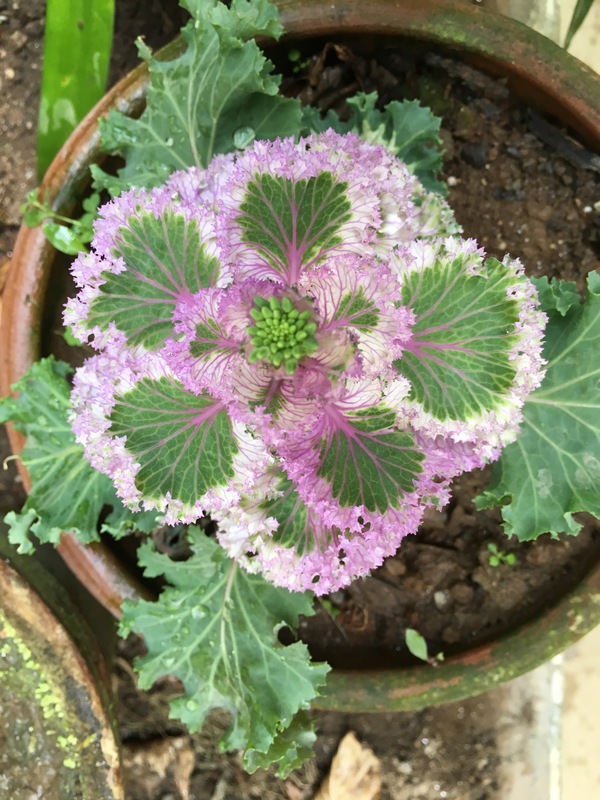 It’s a destination for watchers of birds, plants, butterflies, Hindu shrines and Buddhist monasteries, and much more. I learned that Mira Rai had been there the day before my walk, hosting a trail running event. The distances were 25 K, 50 K, and 80 K. I could still see many of the brightly colored ribbons marking the trails for the races. Perhaps you need to walk there to understand why an 80 K (50 mile) run up and down the hills would be a good workout. 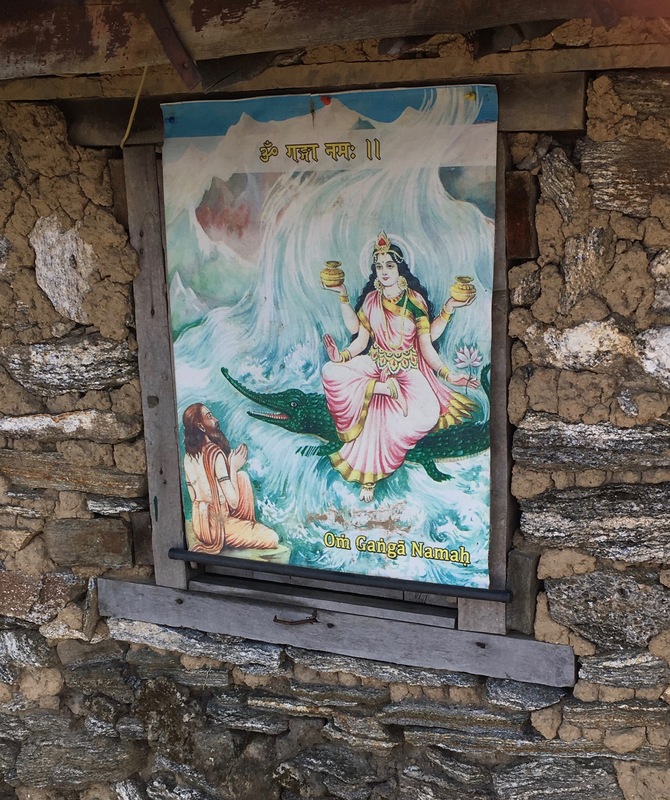 One man ran directly up and down to Shivapuri peak in one and a quarter hours. That’s a good marathon pace by itself, but on stairs at altitude it’s unbelievable. 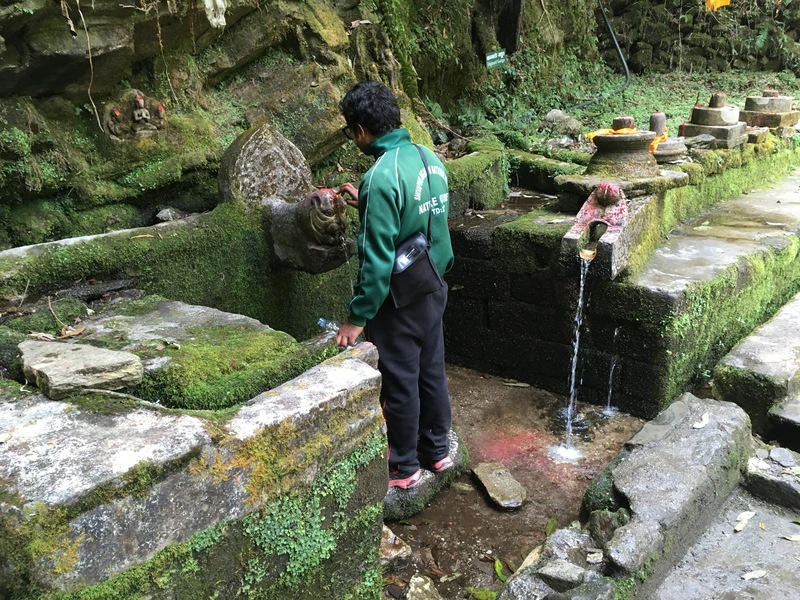 At my more sensible pace, I had a chance to observe more of the natural beauty of Shivapuri. 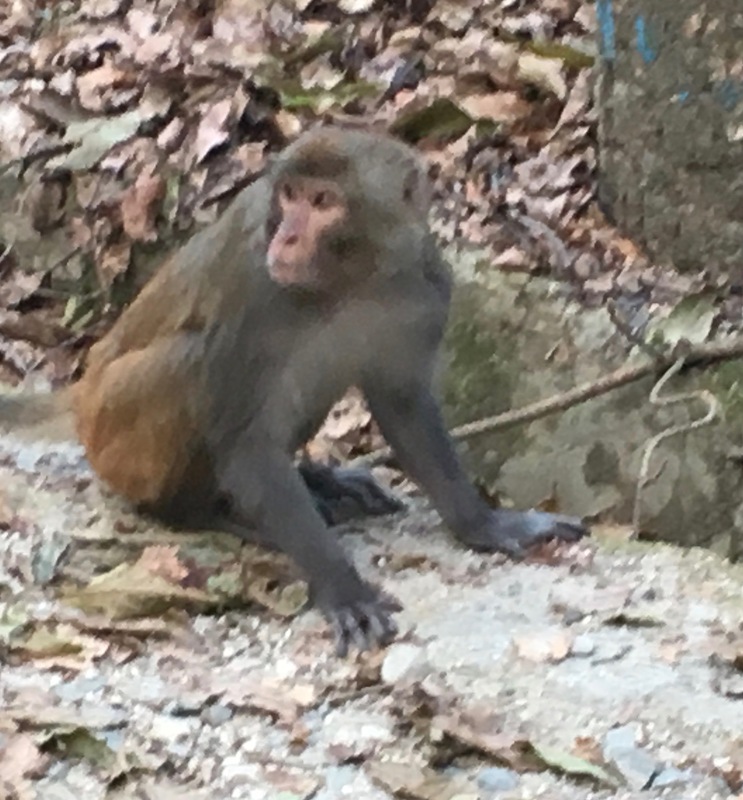 Starting at the Pani Muhan gate, I saw Asami monkeys, a type different from the rhesus monkeys one sees around temples in Kathmandu. There were loud calls from the many warblers in the park, as well as from blue magpies, Bonelli’s eagles, and great Himalayan barbets. I mostly just heard these, but did see kalij pheasants. 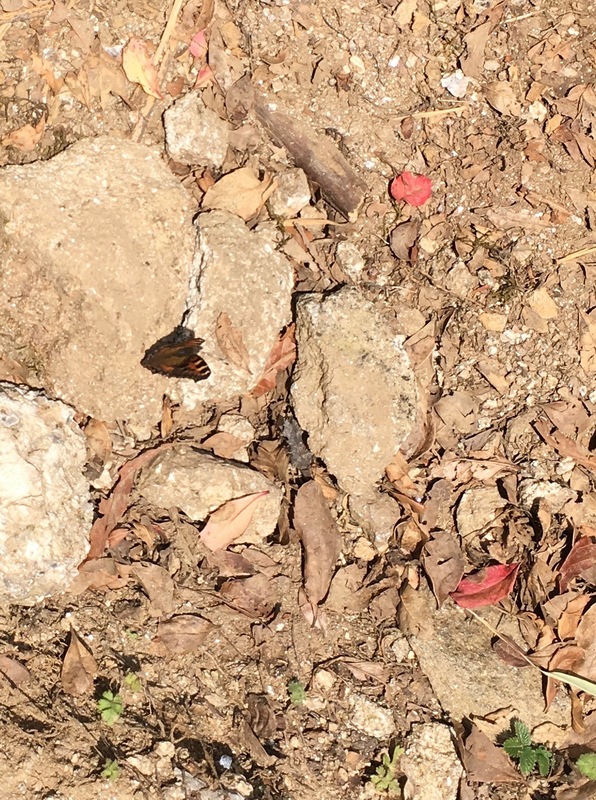 Beautiful butterflies were everywhere, and mercifully, no annoying insects. There are some magnificent pines at the lower elevation, then a dense forest of laurels, rhododendrons, and oaks heading up. The first major stop is Nagi Gomba, a Buddhist monastery run by nuns. There’s a school for orphans. Although there is still much evidence of earthquake damage, fortunately, not al of the buildings were destroyed. You can also fill up your water bottle with clean mountain water. 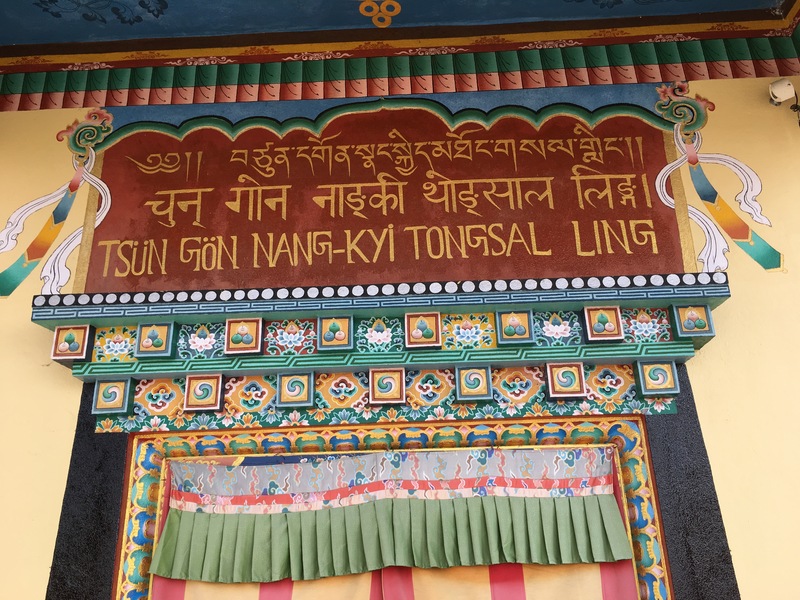 The photo of the main doorway shows the title in a Tibetan language, in Nepali, and in Tibetan with Roman script. I struggled a bit near the top. I was probably dehydrated, getting a little dizzy. At one point the mica on the ground and in the rocks presented me with a beautiful kaleidoscope of flashing lights. I enjoyed that for a moment, until I remembered that I needed to be paying attention to the walking. We managed to reach the summit and paused for a brief lunch. Unfortunately, there was cloud cover, so we didn’t get the view of the Himalayas that many people count on as their reward for the climb. Also, I felt a little sick, which may have had something to do with the mica kaleidoscope. 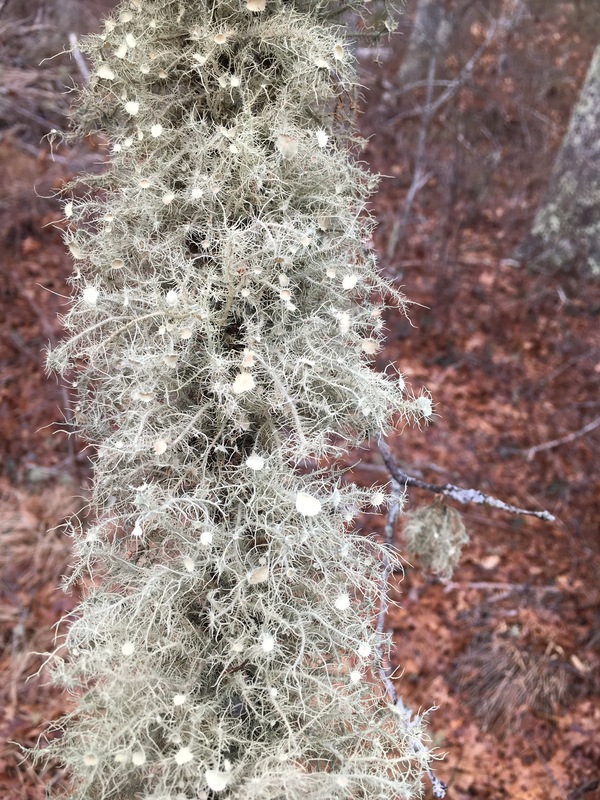 So I walked back down a short way to take care of business in the woods. When I came back up to the peak, I realized that I had technically ascended it twice in one day, something few people do. My pace was glacial and my form was embarrassing, but I made it, and twice! 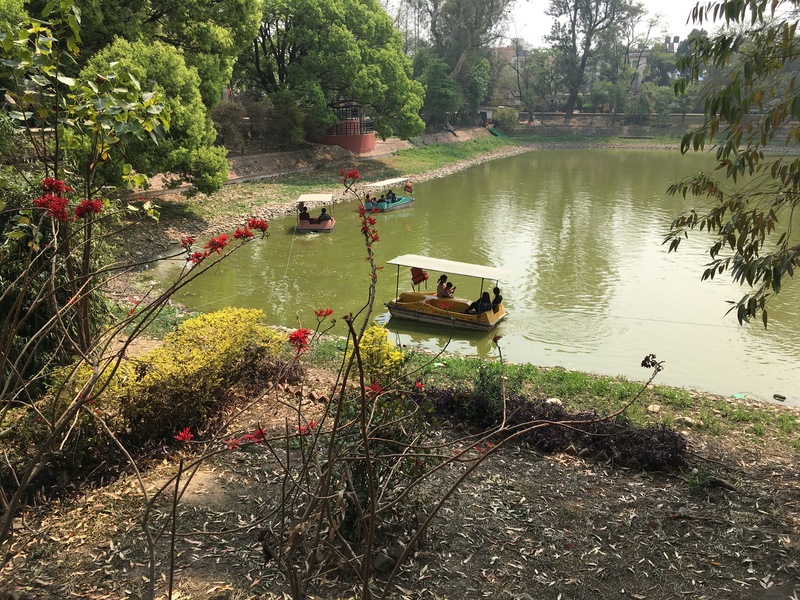 I had a wonderful day at the National Botanical Garden, about half an hour by motorized transport south of Patan, in Godawari. It lies below Mt. Phulchwoki (2715m), which is the highest peak in the Kathmandu valley. It’s an instant relief to be in a quieter place with cleaner air. 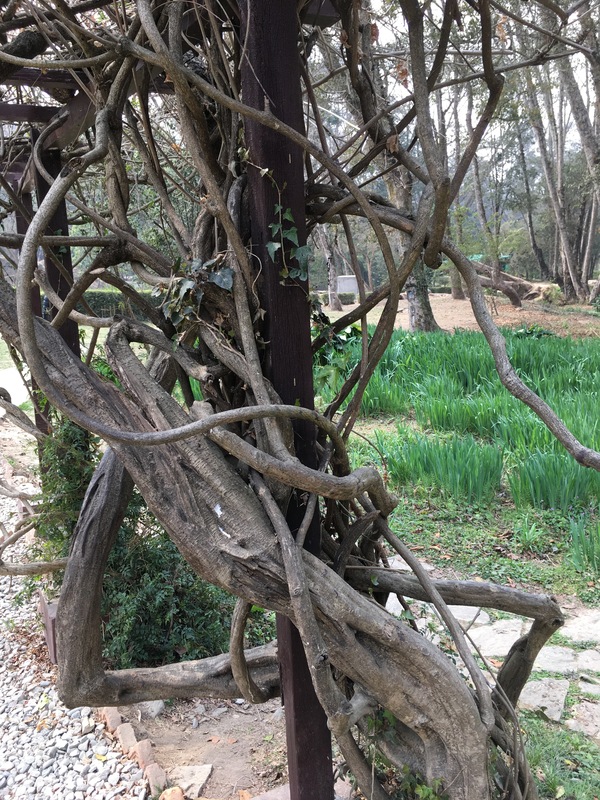 Beyond that, the garden is a pleasant place to walk with many interesting specimens and layouts. 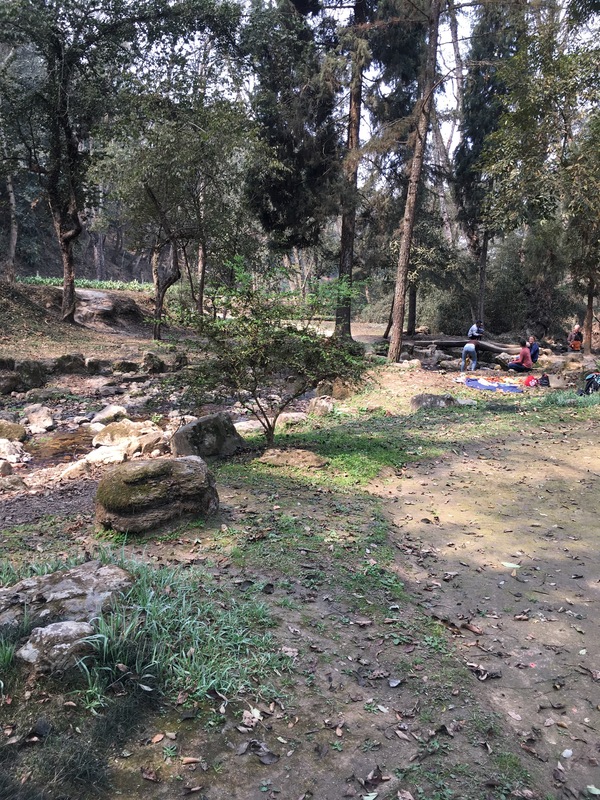 Some of the grounds are relatively wild and undeveloped, but most are organized into special gardens, such as a typical Nepali terrace garden, with a Nepali style stone tap at the top, a water garden, a fern garden, a Japanese garden, a rock garden, a lily garden, and a Conservation and Educational garden for students and scholars. At the start on Lecount Hollow Rd. Peter Brannen’s Rambling Through Time is one of those attempts to make the universe comprehensible, which is fun to try but ultimately fails for me. It’s just too big for my brain. Brannen uses geologist Robert Hazen’s model for a walk, in which each step represents a century back in time. Starting on NY’s Upper West Side, he can’t even get out of the building (the Hayden Planetarium) before he’s passed all of human history. So much for those who think 10,000 BC to the present is a long time! The walk continues at this pace to the Pacific Ocean, but still doesn’t reach the early Cambrian period, when multicellular life as we know it began. And doing that would still represent only 10% of the earth’s history. For our annual Imbolc walk (a few days late, on Feb 6), Daniel and I decided to pick up the pace. At Hazen’s speed we’d reach the appearance of grass by the end of the Cape Cod Rail Trail, but would not see the first large mammals, much less the dinosaurs, or anything else of interest. To get reptiles, fish, insects, trilobites, and so on, we need to go much faster. See [trail map]. The extended trail runs 25.7 miles, so we used that distance as the benchmark. We increased the pace by 100 times. That means that each step is a century of centuries (10,000 years) and each mile is 21 million years. We’d need 50,000 steps to reach the early Cambrian. Maybe 60,000, or more if our stride flags near the end. But at this pace it would take just one step to cover all of human history (the wheel, agriculture, writing, pyramids, Buddhism, geology, the Beatles, etc.). The first humans show up at 1/4 mile, about 4 minutes into our 7 hour walk. If we had the time, Stamford, CT would take us back to the beginning of the earth. I suppose that we could adjust the pace so that the endpoint would be the Hayden Planetarium, but the arithmetic for that hurts my head. Now we need to think about attempting the extended trail next year! 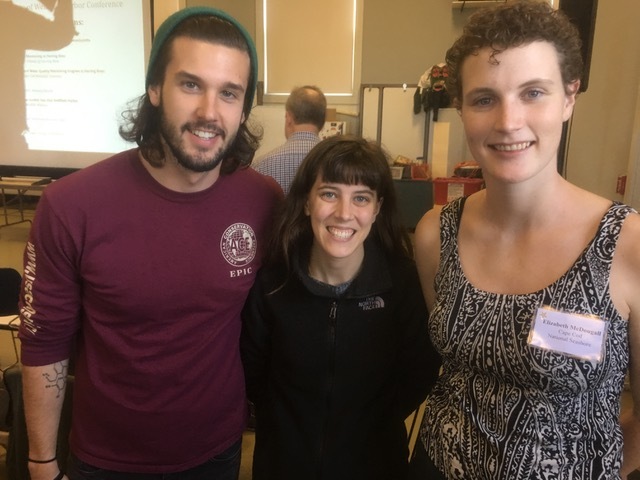 The annual State of Wellfleet Harbor Conference was held at the Wellfleet Elementary School on November 4, 2017. See the schedule here. This was a learning event throughout. Janet Reinhart started off with a reference to Wallace Nichols’s Blue Mind: The Surprising Science That Shows How Being Near, In, On, or Under Water Can Make You Happier, Healthier, More Connected, and Better at What You Do. 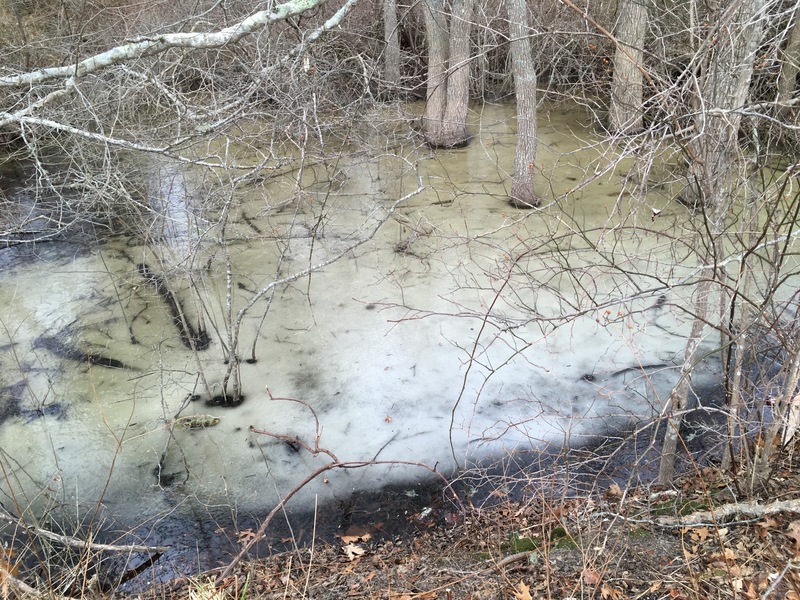 Before we could become complacent about that, we began to see the many threats to the water around us. 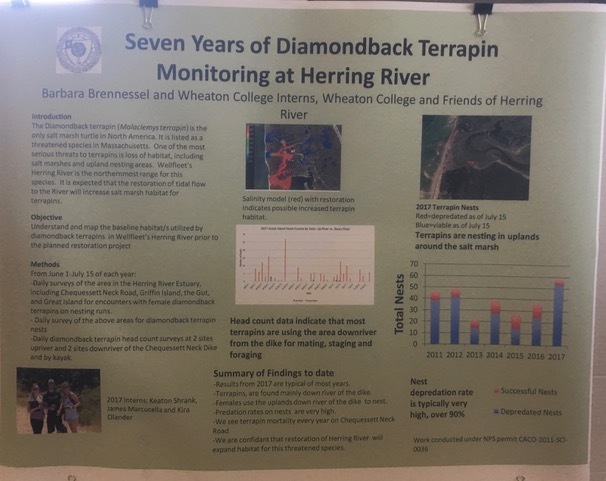 Continuing what’s now a 15-year tradition, the conference showed the complex connections among trout, whales, menhaden, horseshoe crabs, shellfish, seals, terrapins, sunfish, eel grass, phragmites, bacteria, protozoa, other living things, the land, sea, and air. Most notably, it considered the impact of these diverse aspects of nature on people. In every presentation or poster, we saw the major ways in which human activity affects other aspects of nature. The Harbor conference is at once depressing and inspiring. It’s depressing as it details the many ways in which humans damage the beautiful world we inhabit, through greenhouse gas emissions causing global warming, increased storm activity, and sea level rise, pollution of many kinds, black mayonnaise, habitat destruction, and more. But it’s inspiring to see the dedication of people trying to preserve what we can, and to learn so much about the ecology of the unique region of Wellfleet Harbor. The conference is billed as an opportunity to hear about the latest research, a task it fulfills admirably. 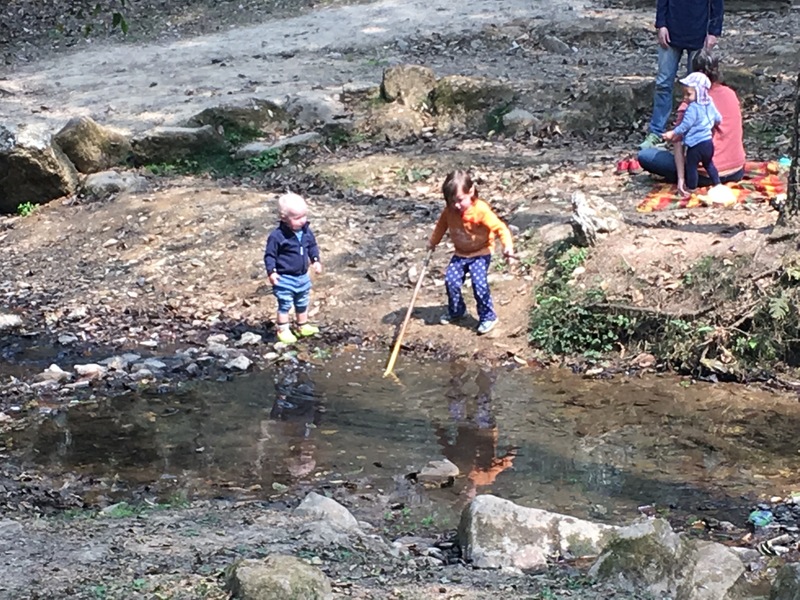 Beyond that, I see it as nature school, or nature as curriculum. 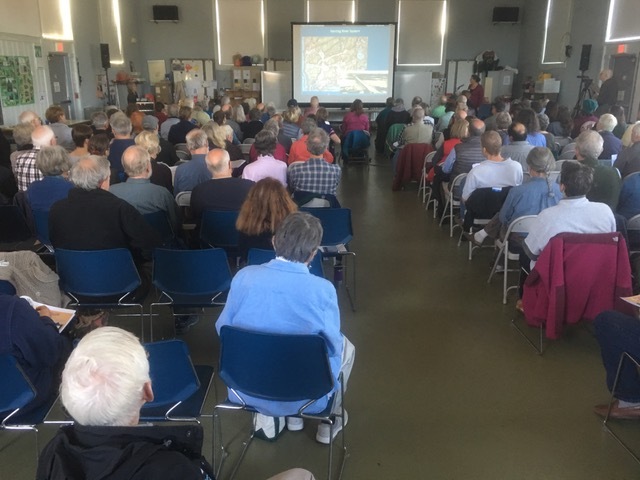 Participants, including volunteers, fishermen, students, town officials, and staff of the Mass Audubon, the National Park Service, the Center for Coastal Studies, and other organizations, come to report on what they have learned. The sessions are not simply reports. For example, Geoffrey Day and Michael Hopper spoke for the Sea-Run Brook Trout Coalition. 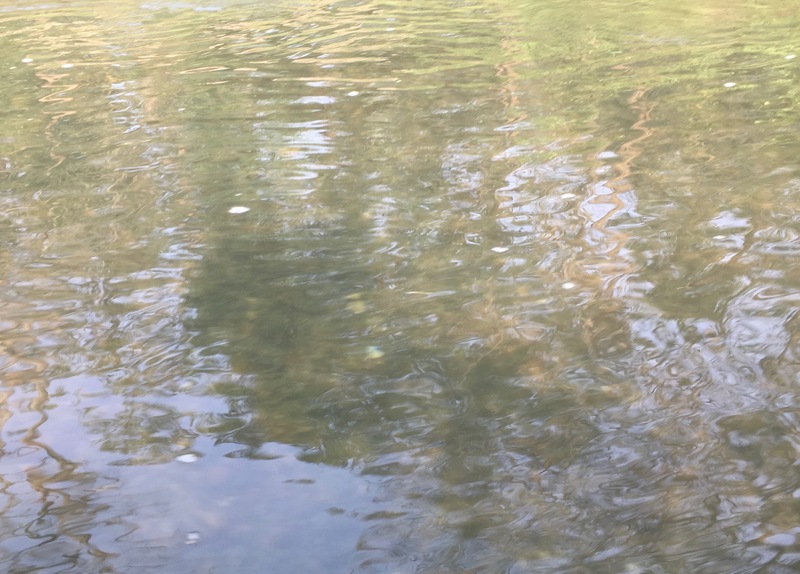 They’re studying the history of anadromous trout in the area and whether traditional runs could be restored. The research is part ecological, looking at the hydrology of Fresh Brook and part historical, using archival data. 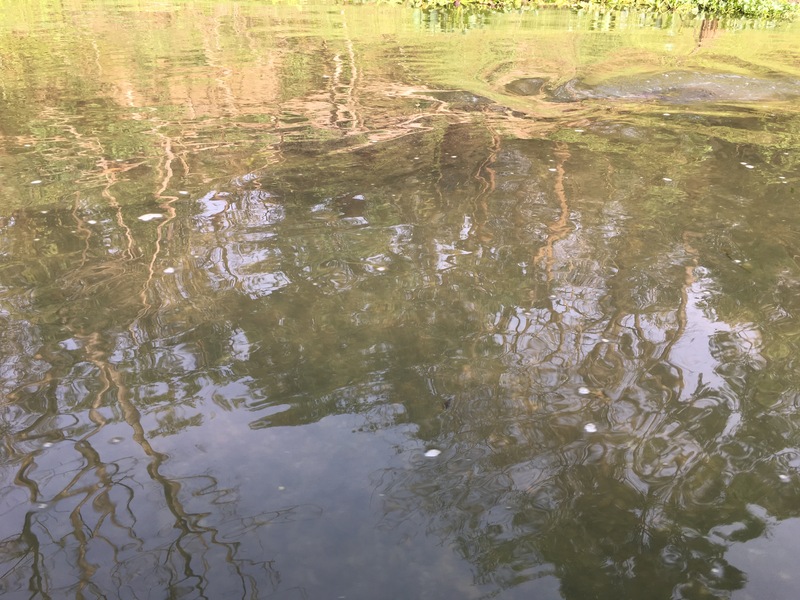 The presenter, Day, asked for listeners to share any family accounts they might have–letters, maps, and so on– which might document the conditions for the trout population from a century or more ago. Whether for brook trout, or many other examples, investigation thus becomes collaborative, a community activity. Moreover, in each case, participants ask “what can be done?” Sometimes the answer is to create, which may be an aesthetic response, political dialogue, collective action for the environment– solar energy, harbor dredging, dam removal, pollution monitoring, and always, more research. Participants continue then to discuss and to to reflect on what they experience, thus enacting an inquiry cycle of learning. You might find similar activities at many conferences. But the Harbor Conference stands out in terms of the collaborative spirit among presenters and audience and in the ways that knowledge creation is so integrated with daily experience and action in the world. This learning was not in a school or a university; there were no grades or certificates of completion. There weren’t even “teachers” or “students” per se. 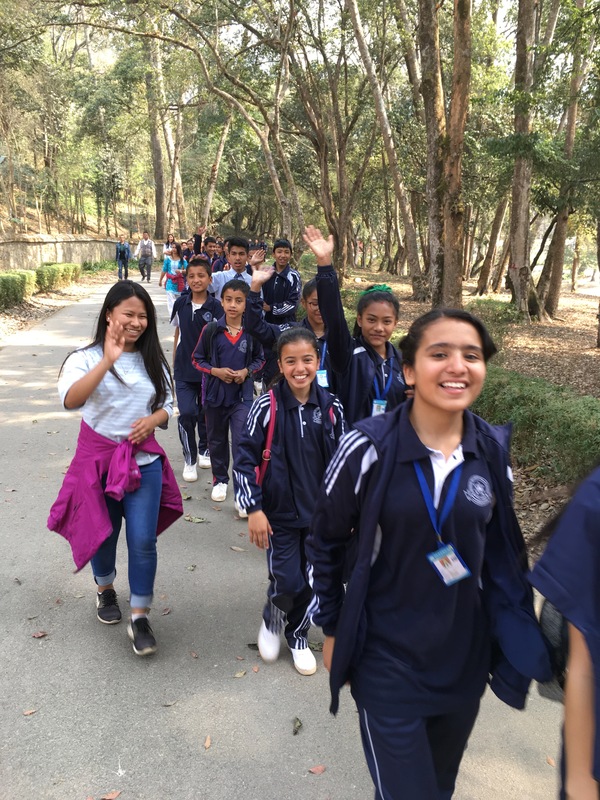 However, by engaging with nature along with our fellow community members, we explored disciplines of history, politics, commerce, geology, biology, physics, chemistry, meteorology, and more. 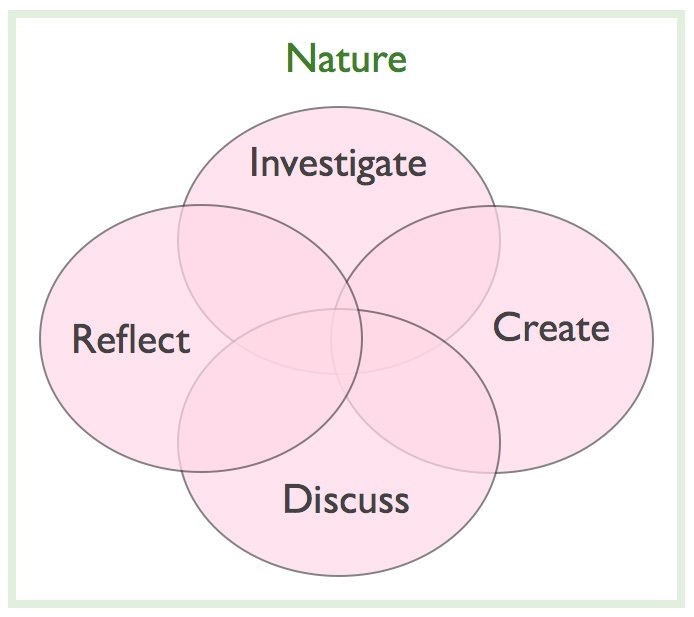 Nature itself became our curriculum guide. 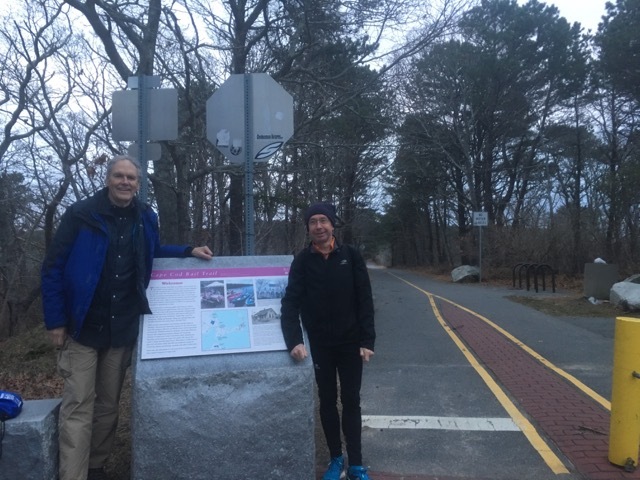 Shortly after dawn on Sunday, Daniel Dejean and I set out to walk the Cape Cod Rail Trail (CCRT), not just to walk on the trail, but to go the entire 22.3 miles. I like to walk long distances at a brisk pace, but I was worried about going with an accomplished marathoner, one who would probably be bored with my pedestrian pace. But Daniel seemed quite happy to walk instead of run. In the beginning we had the trail to ourselves. Perhaps others were deterred by the hour or the temperature just below freezing? In any case, it was heavenly. We enjoyed the exercise, the views, and the conversation. For equipment, we took along one not-smart phone and a fancy watch that didn’t work. For six hours, we saw a side of Cape Cod that you miss completely if all you know is Route 6, the beaches, or the residential streets. Since the trail is elevated, it offers a better view than that afforded by many forest trails. 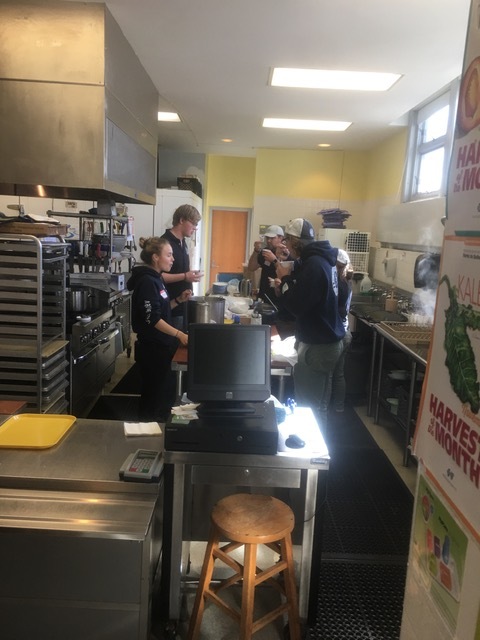 We saw natural wetlands and cranberry bogs, salt marshes, meadows, forest, creeks, the bay, and the back sides of houses, churches, and businesses. There’s a winery that I didn’t know about. We talked about what we each liked and didn’t like about life on Cape Cod, music, art, movies, growing up, religion, Borges, Deleuze, Piaget, and OULIPO. We also had good stretches of silence, just listening to the birds and the wind, or walking without listening at all. Amazingly, we avoided the political discussions that seem to dominate the ordinary day. A long walk imbues your body with a rhythm that offers peace and balance. We joked about Daniel’s fancy electronic watch, which told us all kinds of things, but seemed incapable of communicating the time of day. We saw it as very postmodern, or perhaps Buddhist, in its rejection of our chopped up daily lives. Our overall pace was 3.6 mph. That’s faster than Google walks, but still fairly relaxed. Around 17 miles we each began to feel the stress on our bodies. Daniel revealed that he feels the stress at the same point when running a marathon. It’s interesting that it occurs at the same distance, but of course half the time when running. As the sun rose, we began to see more people. There were people walking their four-legged masters, babies in strollers, people in wheelchairs, couples, groups, and solitary walkers. Each of them were experiencing a slice of Cape Cod that is hard to find in any other way. I don’t know that any of them planned to walk the entire route as we did, but I’m sure they each felt some degree of balance as articulated by Taccuino Sanitatis. This is an 11C Arab medical treatise by Ibn Butlan of Baghdad which sets forth the essential elements for well-being, including balance of activity and rest, food, fresh air, and state of mind. Daniel pointed me to that. 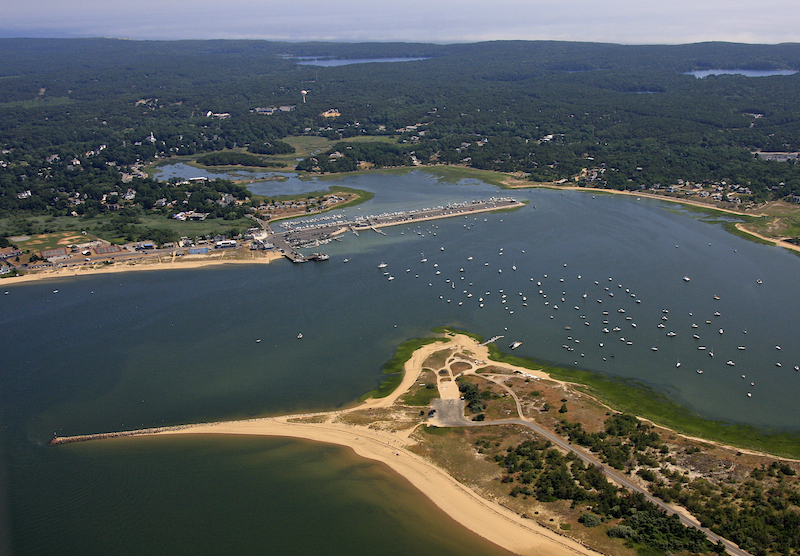 Before the railroad came, Cape Cod was accessible only by boat or stagecoach. 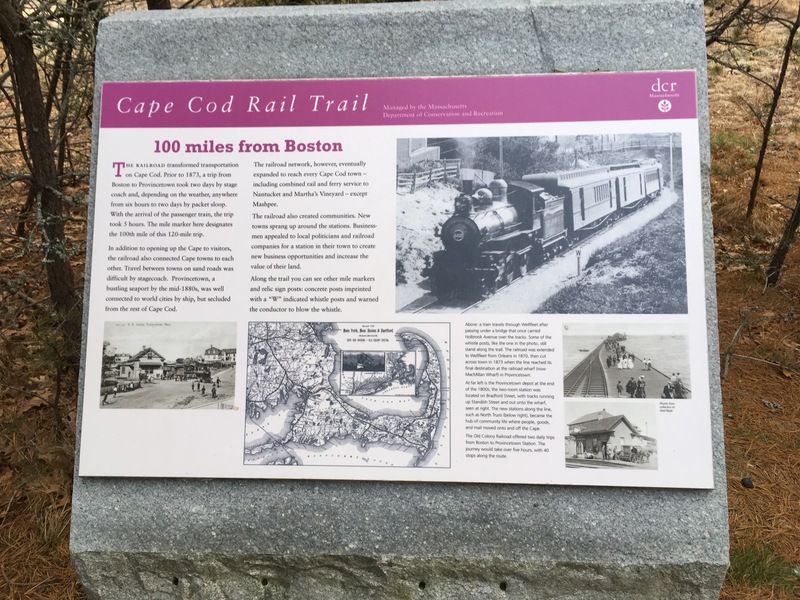 Passenger rail service from Boston to Provincetown started in 1873 and became a major factor in the Cape’s growth as a summer resort area. But when the car bridge over Cape Cod Canal opened in 1935, passenger rail service soon came to an end. The cars were a boon for tourists and tourist services, but they also began to destroy much of what makes the Cape so special. Residents and visitors who see the Cape mostly from their cars or selected recreational areas miss a lot. The rail corridor was purchased by the Commonwealth in 1976. 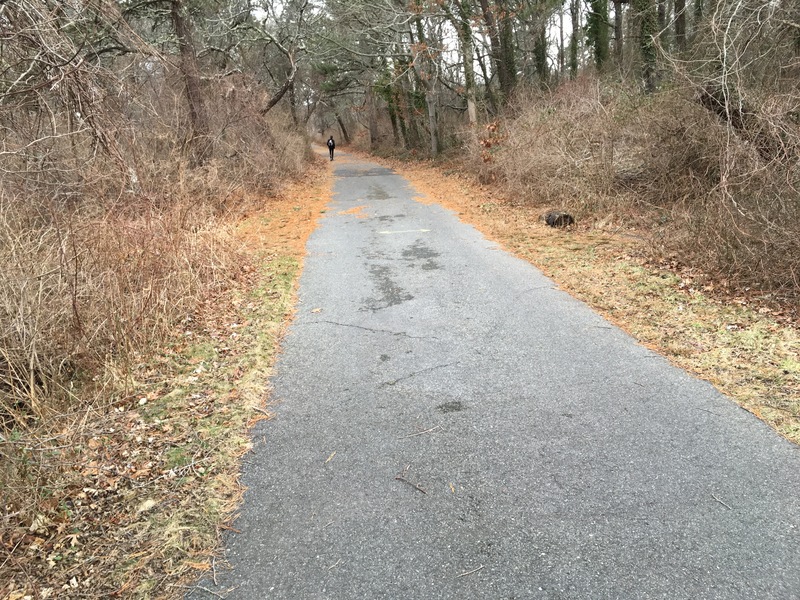 A portion of that was converted to a rail trail, which now runs from South Dennis to Wellfleet with side trails going off to Chatham and other areas. 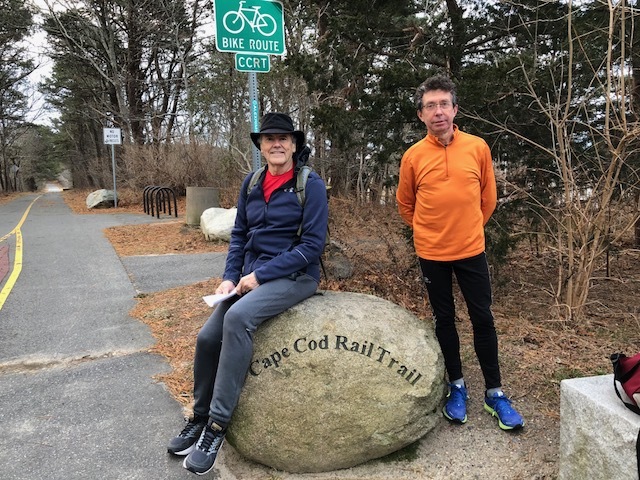 Daniel’s uncommunicative watch told us that the trail on the rail bed was a way to step back in time, to connect to some of that earlier Cape Cod life, and to experience a more balanced way of life. Who invented the amazing paper bag? What's wrong with education today?